Welcome to my website! I would like to begin our friendship by giving you a sneak-peek of my newest release -- "The Historical Adventures of Alfred J. Buttermouse" (which is no longer a work in progress). I'm happy to announce that all three episodes are finally available in the iBookstore and Kindle. The print version will be available soon! Let's begin by taking a look at the new book's cover illustration followed by the foreword and a brief synopsis. And don't forget to click on the other tabs at the top of this page to find out a little more about me and my books. My most popular release, "Bring Your Racquet: Tennis Basics for Kids" can be found at all the usual places (Amazon, Barnes and Noble, Borders, etc.) or you can click on my publisher's webite. Corked inside of a tiny bottle, the idea for the book you are about to read came to me in the form of a miniature diary. While walking on the beach one day, dragging my feet through the sand, I unearthed the small container. Using a small pair of tweezers, I extracted its contents very carefully. Each page of the document must have been no larger than a bubblegum wrapper. But with the aid of a strong magnifying glass, I was able to decipher most of the bottle’s contents. Who could’ve written something so small? Could it be a hoax? If I had not have found the bottle myself, I would say “yes” – the document is a fake. But that not being the case, I believe the writing to be authentic. A teacher and scientist friend of mine told me to send the document to experts for examination, but I did not feel it was necessary and decided to draw my own conclusion. That being said, I realize that historians have been recording facts for hundreds of years, and that, most things written can be backed by physical evidence, or some other accounting. But that did not influence my deduction – the diary was written and illustrated by a flying mouse! Furthermore, I am also aware that some of the articles in the journal may not concur with today’s history books. This I cannot explain but it seems reasonable to believe someone who kept a record of so many events in his life so meticulously. I wish I could have published the diary as it was written, but some of the pages, blurred as they are, must have gotten wet at some point before their discovery. So without any further explanation, told from my point of view, the following is the amazing story of Alfred J. Buttermouse – rodent extraordinaire. 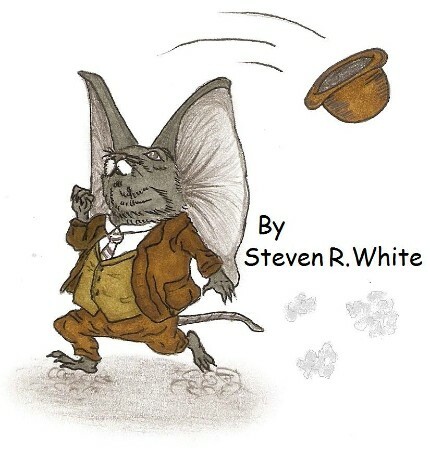 Alfred J. Buttermouse (as the little mouse came to be called because of his unusually large, butterfly-wing-shaped ears) was the subject of everyone’s mockery. All the forest animals teased him so. In fact, Buttermouse’s ears were so large that if he were ever caught in a blustery wind, he would more than likely be swept away like a balloon that’s been let go, or a kite with no one holding the end of the string. Having heard enough of the teasing and laughing, Buttermouse ventures out to the edge of the forest where the winds are strong enough to carry him away. Well, that’s exactly what happens…and this is where the adventures begin. Cleverly woven in the fabric of each adventure are whimsical illustrations and historically accurate slices of time that will capture the interest and minds of young readers, promoting their innate sense of wonder and fun in reading. Adventure One - "Buttermouse and the Cowboy"
When the wind releases its strong grip on the little mouse, Buttermouse meets a cowboy in the desert. The cowboy, whose name is Rowdy, teaches Buttermouse many things about his trade and the cowboy way of life; including the experience of the roundup, handling herding dogs, branding steers, cowboy wear, tools of the trade and how to use them, and life on the trail. The story climaxes when a mountain lion stampedes the herd into a nostril-blowing, hoof-stomping frenzy. When the ferocious predator leaves with his meal in tow, Rowdy and his border collie (Buddy) gain control of the herd before more steers are lost. The trail ends when Rowdy, Buddy and Buttermouse finally get the steers to market. In the end, Buttermouse once again takes his chances with the wind in an effort to get back home, only to wind up right smack in the middle of another escapade. Which is where the next adventure begins. Adventure Two - "Buttermouse and the Flying Pioneers"
Buttermouse flutters down on the beach of a small coastal town named Kitty Hawk, where he meets two men carrying a contraption that to Buttermouse looks very much like an extremely large kite. The men’s names are Orville and Wilbur – the Wright brothers. Buttermouse and the brothers become very good friends, sharing their experiences of gliding on the wind. But gliding is not flying. The bond that pulls them together is the desire to master the art of controlled flight. Sharing what he learned on his two previous glides, Buttermouse helps the twosome progress from simple, wooden fixed-wing flight, susceptible to the vagaries of the takeoff field, the wind, and the shifting weight of its prone pilot, to a fully mechanized machine, capable of extended and controlled flight. In return, the brothers help Buttermouse perfect his flying skills by allowing him to train in one of their new inventions – the wind tunnel. In the end, Buttermouse and the Wright brothers accomplish something that no mouse, or no man, has ever done before – controlled flight for the very first time…and they do it together. Adventure Three - "Buttermouse and the Sails of Plunder"
On his way home from Kitty Hawk, Buttermouse gets blown off course by one of the nastiest storms he had ever seen. It had been hours since he’d seen land, and he suspected he was miles off course somewhere over the Atlantic Ocean. “If I only had a compass,” he thought. Looking for a place to rest his ears, Buttermouse finds himself on board the Sails of Plunder – the cursed vessel of the Caribbean. In spite of the curse, a dark misty cloud hovering above, Buttermouse remains on board the pirate ship to keep a running account of his new and adventurous life as the captain’s cabin boy. In his journal, Buttermouse writes of life on board a pirate ship, Captain Pillage’s nasty deeds, historically accurate methods of piracy, and an encounter with the Barracuda – a ruthless female bandit. The journal climaxes when Buttermouse boards a ghost ship inhabited by a crew of revenging dead souls in the form of walking, talking skeletal remains. And at the crux of the curse (the haunting of Captain Pillage and his band of cutthroats), things get more than a little heated with cannons blazing and one pirate ship sinking to the bottom of the ocean. Is it the Sails of Plunder? Even though the Buttermouse adventures are specifically created for young readers, adults will appreciate and acknowledge the high level of information in such a fun, attractive, and accessible format. Simply put, a clever blend of fantasy and history.